About a year out from the big day, my fiancé, Ryan, and I were pretty sure we were going to take our honeymoon in Europe. We planned to tour Ireland, Scotland, and France over a ten-day trip. When we sat down to budget both time and cost, but we weren’t satisfied that we could spend enough time doing everything we wanted and within an amount that wouldn’t set us back financially. So we scrapped that plan. We decided to work a bit backwards in finding a new destination. Rather than list out places we knew we wanted to see (which were exhaustibly numerous) we brainstormed the things we wanted to do together in our first weeks as husband and wife. We knew we wouldn’t be happy lounging on a beach for ten days (I require SPF 1,000 just to walk around Boston for a few hours), nor would we be thrilled to sit for days on a tour bus with two dozen grandmothers. So, we needed to find something that would provide enough relaxation after a marathon DIY-wedding, while being chockablock full of non-canned adventure. Oh, and we wanted something environmentally friendly. After a wedding for the history books, we were off to Honduras. We flew from Boston through Miami, then touched down in San Pedro Sula, a five-hour flight in all. We waited at the small airport’s Dunkin Donuts kiosk (like we never left Beantown) for an hour, not realizing that our driver, the charismatic, crazy Brit expat Tanya, was sitting about ten feet from us. We arrived in Copan, a bit car sick and tired. My eyes must have been big as saucers as we drove slowly through the village. The narrow streets of the downtown area were patterned in broken cobblestone and gravel, and shared by cars, tuk-tuks (three-wheeled auto-rickshaws), and horses alike. I felt like I had been transported back to turn-of-the-century Deadwood, South Dakota. But if Deadwood were in Central America, most citizens spoke only Spanish, and it smelled a tad like cooking food and burning tires. The eco-lodge where we opted to hang our hats for the next ten days is called Hacienda San Lucas, located over the chocolaty Copan River and up a hill about 2km outside of the main village. We arrived to find we were the only guests, not uncommon for late September, the rainy season. Flavia Cueva, the proprietor with whom we’d been communicating with prior to our arrival was out of town, but made sure to give us a phone call that night welcoming us “home”. We unpacked in our room, beautiful and modest and perfectly appropriate for the lush setting. The stone building housed four of the eight rooms available at the lodge, and boasted endless hot water, high ceilings and comfortable beds. Outside the door were a couple of hammocks, a bistro table and chairs, and more often than not, one of their resident Labrador Retrievers who were always eager to walk us to the main house, where drinks and dinner were served. We were treated to some beer, Salva Vida, one of Honduras’ four national brews, and sat down to dinner, which is always served al fresco by candlelight. Because we were the only guests (there would end up being only a few others over the course of our stay), the staff was extraordinarily attentive (almost embarrassingly so for Ryan and I, who are used to blending in a sea of aloof Bostonians), though have it on good authority that they are that kind no matter how many rooms are filled. After the exquisite five-course meal of local fruits, vegetables and seafood, we retreated, sapped and sated, to our room. While we were down at the main lodge, the candles in the room had been lit. The only electricity available in the evening hours is powered by solar generator, and supplies energy to the bathroom, ceiling fan, and two small reading lights. It was beyond romantic, the candles dancing against the stone walls and wooden shutters. We curled up that night and fell asleep to the sound of happy chirps outside the screened windows. Breakfast the next morning was as extravagant an affair as dinner the night before. We enjoyed huevos rancheros with fresh salsa that came with locally grown and roasted (and in my opinion, unsurpassed) coffee, tortillas, beans, fresh cheese and of course, fruit. For a couple who practically shares a cup of coffee and a vitamin for breakfast, it was gluttonous and delicious. We could see in the morning light all of the village below, as well as the river and the main site of the ruins. It was like an old world painting, soft and bright and a little hazy in the morning humidity. Our explorations were plentiful and always special. One day we took a trip to Finca el Cisne, a coffee plantation in the hills that separate Honduas from Guatemala. 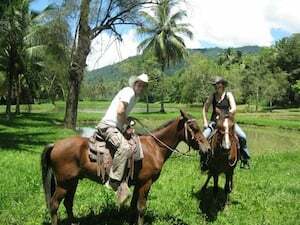 We rode horses across the plantation, ate fresh, sun-warmed grapefruit and star fruit from the trees, saw where and how coffee grows (I will never scoff at the cost of java again! ), and enjoyed an endless lunch of farm-fresh food at the owner’s family table. On our way home, we stopped by the Lunar Jaguar Hot Springs, a natural hot spring in the side of a mountain on which small, relaxing pools have been built. It’s secluded—you have to cross a rickety suspension bridge to get there—and absolutely stunning. While we scrubbed our skin with mineral mud, an owl sat overhead watching us. It was the only other thing around. On another day we took a zipline canopy tour over the valley. It was gorgeous, extremely fast, and insanely fun. We had the opportunity to visit Spa Ixchel, named for the moon goddess, at which we received mud treatments and spent some time in the temazcal, a Mayan sweat lodge meant to purify and rebirth the spirit. It was a rejuvenating and moving experience like none other. We had the opportunity to visit the only brewery in town, a cozy basement drinking hole run by a German expat named Thomas. His wheaty, murky Euro-style beer was delicious and we spent hours there talking to him, a couple of American transplants, and some local kids who were home from college for the weekend. We visited Macaw Mountain bird sanctuary, which boasted an interactive area in which you could surround yourself with a dozen macaws and little to no supervision, feed them and have them hang out all over you. (A macaw is not as light as a feather, by the way, and they love shiny things. Leave the wedding rings at home!) We took a tuk-tuk home (because that’s was San Lucas had become to us) in what can only be described as a monsoon, but those little three-wheelers sure can haul. We were drenched, covered in mud, and laughing when we got back to the lodge. While the rain played a factor in our trip, it didn’t dampen out spirits. In fact, it made for a couple of notable stories. One afternoon we decided to go into the village for dinner, so we took a tuk-tuk to Twisted Tanyas, a tourist-oriented eatery owned by the woman who originally drove us from the airport, and her husband, Garnel. It began to rain as we sat down to dinner, and within minutes the power had gone out (not uncommon and easily ignored since almost everything runs on wood, gas, and candle power anyway). We enjoyed an intimate, laughter-filled dinner by candlelight as the drizzle turned into a wall of water and thunder boomed overhead. It was exciting and fun and memorable. Because so much rain had fallen by the time we were finished, Flavia called the restaurant (like a fairy godmother, she always knew where we were somehow) and told us the driver, Pilo, from San Lucas would bring us back in the landscaping truck. He picked us up and as we tried to go home, we saw the river had flooded and was completely impassable. Ryan and I were without any of our things save for a little money, identification, and a camera, so we weren’t sure where we’d stay that evening. He called Flavia, who arranged for us to sleep at Casa de Café, a small hotel in town run by Howard (whose son, coincidentally, lives just a couple miles from us in Boston). And that’s where we stayed for the evening, laughing at how unpredictable and fun this honeymoon had turned out to be. By morning the river had receded and we were brought back home. A couple of days later, we visited Las Sepulturas, another site of ruins about 4km outside of the village. We had decided before the rain came that we would walk back on the cobblestone footpath that ran alongside the road. Just steps into our return, the skies opened and our path flooded. Ryan’s sandal immediately broke, and we laughed and complained all the way back to town as local families huddled under awnings watching the two crazy tourists slosh back in the rain. Some of the roads in town were impassable with cascading water flowing over them like river beds. We finally got back to San Raphael, the little coffee shop. We sat, soaking wet, for an hour, warming up on coffee and reading the soggy books we’d been carrying in our bag. It was strange and relaxing and memorable, just like the rest of the trip. On the last day we were enjoying our final breakfast at San Lucas, when Argi stopped by our table to tell us she was going to prepare our bill. As she walked off, Ryan gave me a panicked look. It was that moment we’d been putting off in our thoughts since we’d stepped off the plane. Since most everything had been arranged by San Lucas, it had mostly been applied to the bill there, for instance horseback riding, the coffee tour, the hot springs, the canopy tour, and the spa. Save for the few meals we ate off-site, transportation, and a couple of sight-seeing expenses, everything would be on that final statement. Argi set it down in front of us. Ryan opened it, squinting one eye in hesitation as he did so. Quickly, it popped open in surprised relief. 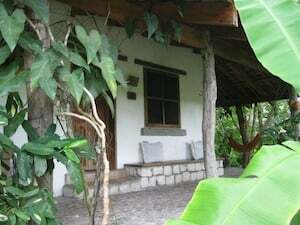 The bill, which included eight nights of lodging with breakfast (two nights had been spent in the village), twelve dinners, twenty-one beers, activities, and a gratuity split amongst the San Lucas staff (from meals and services—they don’t accept cash tips) came to just under $1,500. Add that to the $1,000 we spent in airfare and the expense of other meals and activities, the entire ten-day honeymoon cost about $3,000. It was the best $3,000 we ever spent, and an incredible value for what we got. 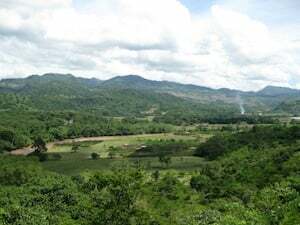 We have been and will continue to recommend Copan Ruinas, the Hacienda San Lucas, and all of the other places mentioned to any couple seeking a little off-beat adventure and relaxation. The price is practically unbeatable, and I cannot imagine a better place to truly enjoy the company of one another, and learn, and grow together. It’s been only a few months since the honeymoon, and I miss Honduras immensely. I think of it every day, the fun we had, the amazingly kind people who live there. As offbeat as it was for a honeymoon, I am absolutely certain that it was meant to be where we visited, and I am equally sure it is somehow going to play a part in our future.